Classic down comforter recreates the restful sleep experience of your favorite hotel night after night. Our classic box stitch design keeps the fluffy down fill from shifting so it stays evenly distributed over you for blissful sleep in any climate. What more can I say, it's warm, comfy, light AND just like at the hotel. Perfect. Thank you. One night at a fine hotel is wonderful, but 365 nights is even better. Upgrade your year round sleep experience with our Hotel Down Comforter in a classic box stitch design that is excellent in any climate. 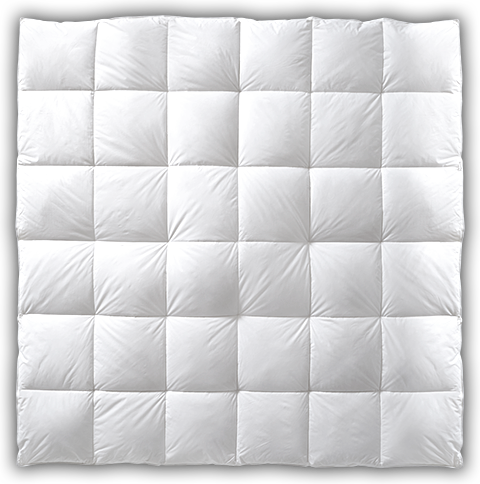 The 550 fill power Hyperclean® down encased in soft 230 thread count 100% cotton will envelope you in fluffy comfort. The sewn through box construction keeps the fluffy down fill evenly distributed over you for a great night’s sleep. The Hotel Down Comforter is ideal for those who sleep at an average room temperature.